Let's be real. Virginia Beach and Williamsburg are huge resort areas. Resort areas mean huge wedding populations. And with huge wedding populations, there's bound to be a huge influx of wedding guests coming from out of town. 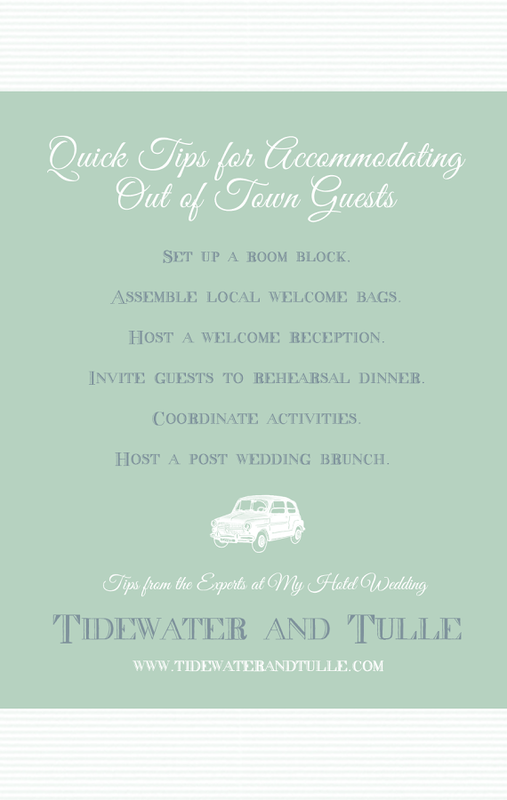 Today, I have an expert here sharing some tidbits on accommodating those out of town guests for destination (and even sometimes local) weddings. Lauren Randolph, founder of My Hotel Wedding spent the past five years working with Four Seasons Hotels and Resorts on weddings and events for the Beverly Wilshire in California. So she knows one or two things when it comes to hotel weddings and the people involved with them. I'll let her take it over from here! * Be sure to set-up a room block with the hotel. Once you've decided where you'll be hosting your wedding, make calls to local hotels in the area and ask for special rates for your guests. Normally, hotels will offer a complimentary block with no commitments for 10 rooms or less based on availability. If you expect that more than 10 guests will stay at your wedding hotel, you will most likely have to sign a contract with your property guaranteeing a specific number of rooms. Don't forget to also call neighboring hotels for rates as well so your guests can have different options at different price points. * Consider assembling welcome bags! These are a favorite detail of ours at My Hotel Wedding because they're the perfect opportunity to be creative. Think of them as a teaser for your wedding weekend. One item that's always great to include is a document on the destination and activities to explore. The hotel's concierge can easily provide you with all this information. We also love stuffing welcome bags with water, sweets, snacks, aspirin, hangover cures, invitations to the welcome dinner and so much more! Find inspiration from the destination by choosing local treats or some of your favorite items for your guests to experience. * Host a welcome reception. A reception is not required, but depending on your budget, it's nice to host a welcome reception when the majority of your guests arrive at the hotel. You can offer some cheese, wine, hors d'oeuvres and great conversation to get everyone pumped up for the weekend to come. * Invite all guests to the rehearsal dinner. Traditionally when hosting a destination wedding, you should invite all guests to your rehearsal dinner as they've incurred a lot of expenses and time travelling to your wedding. And since you're having a destination wedding, why not make it a weekend's worth of fun and spend more than one day with your guests. * Coordinate guest activities. As we mentioned with welcome bags, a list of activities and adventures are always a great thing to provide. We had one couple organize an optional Hollywood Tour of the city for their wedding guests, and it was a complete hit! And local to Hampton Roads, one of your featured weddings had a private golf tournament for their guests! * Host a post-wedding brunch. This is the emotional farewell, but remember it's not goodbye. The brunch offers you one last chance to hang out with all your wedding guests while enjoying breakfast together. So instead of being sad, offer one last toast and thank you to your guests for coming before heading off on your honeymoon. Want to get more hotel inspiration? Check our the ladies behind My Hotel Wedding on Facebook, Pinterest, and Google+! Do you have any special destination wedding advice for Hampton Roads? Post a comment below or share on Facebook!